Stopping by the site for a fresh take on the TV series Happy Days and some insight as to how it both re-popularized some fifties rock acts while turning the overall image of that revolutionary era into something harmless and cartoon-like? Well, you won’t find that here today. Sorry. That show was well before my time, but then again the music we’re covering now was even further back so who knows, maybe the TV show will be delved into when we get to 1974 in a special We Interrupt This Broadcast feature (no promises though). So for those expecting to see Ron Howard’s cheery face, Anson Williams glazed expression and Henry Winkler’s impassive veneer staring out from the page, you’ll have to settle instead for Hal Singer’s bewildered and frustrated look that comes across when listening to him try and pass muster as a rocker, a field he initially had helped define with his best record and then, in the months to follow, seemed to want to refute those advances and return – us and him both – to a more restrained and sensible era of music. Consequently as Happy Days (Singer’s new record, not the television program twenty-five years in the future) shows, Hal Singer was now a long way from Inspiration Point when it came to coming up with something inspired in rock ‘n’ roll. Singer’s discomfort with the more garish displays of honking that rock ‘n’ roll calls for has been well established over his appearances here thus far. A jazz educated musician with serious chops he had found a way to earn money on the side by backing rock artists in the studio which led to some sizable hits for those acts and promptly transformed the musical landscape in black America, taking it away from the more refined qualities of jazz to the more rebellious sounds of rock. As if that wasn’t enough of a self-inflicted wound to his own prospects as a jazz musician heading forward Singer then was coaxed into cutting records under his own name for cash under the table during 1948’s recording ban. Thinking nothing would come of this he let loose with an ostentatious pastiche of every lewd and lascivious sound imaginable that rock had built its unsavory reputation on. 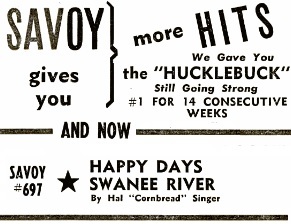 When that record, Cornbread, was released in August 1948 it zoomed to the top of the charts, confirming all of the worst fears cultured musicians had been grappling with over the last year ever since Roy Brown had gained notice by introducing this unseemly rock ‘n’ roll into the popular vernacular. For Singer it also meant his short-lived stay in Duke Ellington’s high-class band was over before it really began, not because the Duke booted him for his transgressions against musical decorum but rather because now Singer had the name recognition to put together his own band and tour as a headliner, drawing a bigger audience and more money than many jazz cats. Of course in order to continue doing so he’d have no choice but to give the audience who embraced him after his bedlam inducing playing on Cornbread more of the same. In other words he’d have to keep churning out rock ‘n’ roll no matter how much he might personally be repulsed by it. Whether it was his own conflicted mindset or merely the difficulty in coming up with the precise combination of the required attributes for a rock hit, especially in the instrumental realm where there are fewer options on the table, his subsequent efforts, while not awful and in fact getting him a second hit with Beef Stew, were nowhere near as galvanizing as his lightning in a bottle first offering. The declining returns on his investments reach their apex with Happy Days, his weakest side thus far and perhaps indicative of the folly of trying to shoehorn solid musicians into a field where they felt as if their musicianship was the least important qualification for their effectiveness and who resented the compromise they were forced to make in order to succeed in rock. The rock instrumental of the late 40’s, as we’ve pointed out before, had two avenues for success. The ribald barnburners highlighted by offensive honking saxophones, which is what Singer himself had epitomized his first time around, or the deep sultry grooves that kept listeners locked in a hypnotic trance. Very few records deviated from these formulas or managed to alter them significantly and come away with either a hit or with a record deserving of being a hit. However there were others like Paul Williams, the artist credited (or blamed if you prefer) for establishing the sax instrumental as a cornerstone of early rock, who had generally taken a more middle-of-the-road approach in terms of the intensity of his playing and still managed to remain exceedingly popular. I suppose some of his milder records in this regard acted as a template for what Singer was coming up with now, and the fact that both were under the auspices of the same producer, Teddy Reig, and recording on a label in Savoy that had strong ties to jazz and more traditional forms of black mainstream music, probably meant that they all still viewed musical restraint as a viable option, even as the company had benefitted greatly from Singer’s initial efforts as well as Big Jay McNeely’s records cut for them, all of which were anything BUT restrained. So I’ll grant them the benefit of the doubt in this case when it comes to analyzing their thinking but that’s about as much slack as we can cut them, for what matters in the end is how the record they came out of this with fit into the current landscape. The answer: Not very well. Happy Days is outdated in everyway but one. For starters the blasé chanting – “Oh Doh Day Bo Bah” – is hardly invigorating, nor lyrically sensible, and sounds woefully out of touch with the young rock fan of 1949 who’s already shown their allegiance to something much more primal in nature than this is serving up. The horn lines that accompany it are melodic and reasonably catchy but not stimulating and when the vocals try to convince you otherwise with their staccato “Pows” followed by Singer letting loose with an exclamation point blown with his horn it lets on that all of them were much older established musicians who were coaxed into appropriating, if not gently mocking, the rock sounds for a lark. Having no idea what constituted credible rock ‘n’ roll – or more accurately forgetting what had worked in the past for them – they came up with something that merely sounds like a send up of the style. Things improve when Singer – who for the record wasn’t old and certainly wasn’t unaware of the components necessary for rock legitimacy – comes in with his first solo and hits all the right (err… wrong) notes, particularly the flatulent lows in the song’s most authentic moments. But his heart isn’t in it. This type of music is surely what he viewed as his penance for some unnamed sin and he seems to take absolutely no pleasure in any of it, looking down on the whole display as something beneath contempt. When the he’s joined by other horns, somewhat ill-suited in their construction (William Moore’s trumpet and Chippy Outcalt’s trombone) it almost goes completely off-track. Singer finally adjusts and salvages it with his best playing in the middle of the record, offering up something that combines melodicism and urgency. It’s nothing earth-shattering by any means but it’s at least passable for what he needs to deliver so as not to be completely laughed off the rock stage by an increasingly savvy audience who’s not about to fall for somebody merely going through the motions. Yet it’s still not enough, especially when the others start chanting “one, two, three, four” between each sudden horn blast, another example of an old-fashioned attempt at showing excitement but which comes across as unhip and lethargic to boot. Singer’s second extended passage follows and it seems far better by comparison to what preceded it but amidst better support it’d be noticeably lacking as well. There’s just no genuineness to any of it. No real enthusiasm or effort to make this work. It’s as if they all realized they were out of their league here and unlike the last record, both sides of which showed a solid understanding of the rock construct at least, this has no such framework to fall back on and thus it falls flat instead. You might think this would be bad news for Singer once audiences realized he wasn’t comfortable in rock ‘n’ roll, though if you were Hal Singer it might be good news in that it would allow him to return to his first love and leave this ungainly music behind. No, Happy Days didn’t become a hit and reward the poor playing and outmoded ideas, but it also didn’t result in him cashing in his chips and leaving the table altogether. For some reason Hal Singer stuck with it, perhaps viewing this as merely a slight misstep and making up his mind to correct its flaws and do better next time out. For all of his apparent reservations about rock’s overall quality maybe the opportunities it offered were too gaudy to be fully resisted. Whatever the case may be Singer kept at it, rebounding with future records and remaining entrenched in the rock universe as both a featured player and a backing musician behind others for years. I dunno, maybe it’s like a childish game you try your hand at, one that seems so simple on the surface and when you score with it once out of the gate you get cocky. But the more you play the more obvious it becomes that there’s a subtle difficulty to it that sometimes makes it harder to beat the more you try and that subsequent failure winds up pulling you in even more, just to satisfy your own competitive urges to prove yourself superior. It could be why TV shows like Happy Days continued long after they jumped the shark. Once you hit it big it’s often hard to let go. Leave a reply on "Hal Singer: “Happy Days”"